The Rockstar Energy Husqvarna Racing Team headed to U.S. Bank Stadium in Minneapolis, MN for round 14 of AMA Supercross to compete in the last of three Triple Crown formats in a night packed with action on the track, fans in the stands and snow in the pits. Despite the conditions, Jason Anderson and Zach Osborne both extended their points lead in their respective classes, while teammates Dean Wilson and Michael Mosiman rode hard to respectable finishes. Daytime qualifying would set the field for the nights three race format and 250 Main Event number one would be the first gate drop to get the night show started. Zach Osborne and Michael Mosiman jumped out to top-10 starts with Osborne attacking early and quickly making passes to get to the fourth spot early in the race. He rode strong and finished fourth. Michael Mosiman made steady progress all race long coming from 10th to grab a seventh when the checkers flew. The first 450 main event was up next and it was Jason Anderson up front after a second place start. Anderson rode flawless all race long to stay in second until the end. After starting just outside the top 10, Dean Wilson rode a steady race to get himself into the top 10 with a ninth place finish. 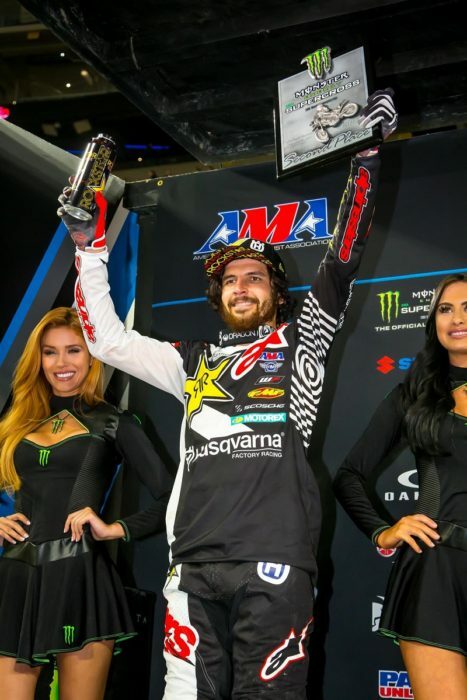 The second 250 main event took off from the start grates and a determined Zach Osborne put himself into second on lap one after a very strong start. Zach wouldn’t be denied as he hunted down the leader and made a pass stick to grab the lead in the middle of the race and take off for the win. Mosiman grabbed a great start and proceeded to pass rider after rider to get all the way up to fifth before a crash put him out of the race with a sore foot. The second 450 main event saw Jason Anderson grabbing a fourth place start and setting his sights on the front. Anderson picked his way to the front and began to work a pass on the leader. In the end, Jason made a little mistake while going for the lead that would drop him a handful of spots in the tightly packed group and would finish sixth. Dean Wilson overcame a bad start and charged all moto long. He made good passes and grabbed another consistent ninth place finish. The third 250 main event rocketed off the gate and with Zach Osborne in the hunt for the overall win for the weekend. After running second, Zach dropped back to fourth early in the race and charged his way back up to the front. He put in an impressive charge to get behind the leader for a chance to make the pass he needed for the overall victory. He finished second, and his 4-1-2 scores would net him second overall on the night. Michael Mosiman showed how tough he can be by lining up for the final race after not finishing race two, and came around in 15th in the first lap. Mosiman gave it all he had and pushed all moto long to come home in 10th. His 7-19-10 scores would land him in 11th overall. The third 450 main event was sure to be exciting with multiple riders in the hunt for the overall victory after the first two motos. Jason Anderson set out to avenge his mistake in the previous race by jumping out to a third place start and quickly going to the front and getting into the lead. Anderson would ride away from the pack to grab the final race win of the night and with his 2-6-1 scores would grab second overall and extend his points lead to 39 with three rounds to go in the championship. Dean Wilson grabbed his best start of the night in the final race, running well into the top 10 early on. After connecting with another rider, Wilson fell all the way to 21st and would be forced to come from the back for the rest of the moto. When the checkered flag came out Wilson would card a 13th place finish. His 9-9-13 scores would give him 10th overall for the evening.